If you cannot get used to the ribbon interface of Microsoft Office 2007, 2010, 2013 or 2016 because it does not display all the options needed to do the job in one place, or because you dislike using a ribbon interface, you may like the Microsoft Office add-on Ubit Menu which brings back the classic ribbon-less Office toolbar interface. The software developer released an international version of the Microsoft Office add-on just recently which added German, English, Italian, Spanish, French and Portuguese support which means it can be used with those Microsoft Office versions as well. The installation of the add-on is straightforward. It can be downloaded as an executable from the developers homepage. The setup installs the classic Office menu in the three Office programs Microsoft Word, Microsoft Excel and Microsoft PowerPoint. It is required that you close all open Office programs and tools before you run the installer. The changes are visible immediately after installation and first start of one of the supported Microsoft Office programs. Note: UBitMenu for Office 2007, 2010, 2013 and 2016 is free for personal use only. If you use it in a work environment, you are asked to purchase licenses to do so. The Microsoft Office add-on can be uninstalled from the software uninstallation menu of the Windows operating system. The add-on will bring the classic Office menu known from Microsoft Office 2003 to the supported programs Office versions. 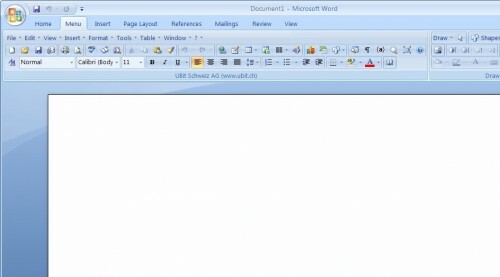 Below is a screenshot of how Office 2007 looks like after installation of the add-on. It should be noted that the Microsoft Office add-on Ubit Menu will leave the current Office ribbon interface as it is. It does add a new entry to that menu on the other hand called menu which combines all the menu entries known from Office 2003. Depending on which version of Office you are using, you may be able to minimize the ribbon interface after installing the classic menu add-on. Try the shortcut Ctr-F1 first as it is used by all supported Office versions to hide or display the ribbon interface on the screen. Additional information about that as well as a manual option if the shortcut is not working are provided on the Microsoft Office website. Update: The developers have updated the classic menu add-on for Microsoft Office so that it is now also compatible with Office 2010, Office 2013 and Office 2016. Users need to make sure that all program instances of Office are closed before the program installer is run, as it will mess up the installation otherwise. I was so horrified by the ribbon – mostly its huge space robbing size – when I bought Office 2007 that I rushed it back to the store after one day and replaced it with an earlier version of the office suite knowing it would be my last purchase of MS OFFICE. When I read that someone had produced a classic menu I was really happy about it but now that I see what it is I am very disappointed. What is all that? SIX layers of bars and what? A frame? Wow. Does it leave any room at all to see what you are working on??? Will someone please explain to me Microsoft’s determination to take up every bit of working space it can? Worse yet – what Microsoft does, all other software makers blindly follow,making their applications as space destroying, tedious, and irritating as MS.
Ubit menu is awesome. Takes a second to download and 2 seconds to install. Best three seconds spent recently. It works in Word, Excel and Powerpoint. Microsoft really stuffed up with the ribbon. Its one of the biggest mistakes they ever made, of course I am excluding Windows ME (Many Errors) and Vista. And not being able to customise the ribbon, thats an even bigger mistake. Microsoft seem to have this habit of giving people what they think we want rather than what we do want. They can put in the ribbon if they want, but leave the option there to have menus for the people who want them. In earlier versions of Word there was Wordperfect help and you could even change the screen to blue with white text. What about the people who have been using word for years? Ubitmenu only includes old menus for Word, Excel, PowerPoint. Classic Menu for Office 2007 of Addintools.com includes old menus for Word, Excel, PowerPoint, Outlook, Access. It have more old commands of 2003 and more new commands of 2010. It is available to show/hide and old menus and ribbon tabs. I have been using the Ubit Classic 2003 menu for years now and just upgraded to Office 365 where it does not work, so I am looking at the new version because I am really a hater of the Ribbon Menus since it takes soo long to find what I need. WTF will MS change what everyone is used to? It really piss me off that MS keeps making my life more difficult and trying to say it is better. Just venting…same as when IBM came out with the T500 laptop and decided to swap the Ctrl and Alt keys around on the keyboard. Wrote them too 5 years ago and still waiting on their response. Same as MS as to why they replaced a good easy to use Menu with this fricking Ribbon that takes up a good portion of my screen. WTF!!!! Have a look on the OfficeClassicMenu (www.officeclassicmenu.com). Same as UBit-Menu but new and works find with Office 2016.